It was a bad start for Paper Mario: Color Splash. Much like Metroid Prime: Federation Force, the Wii U exclusive was met with a negative backlash after it was revealed as part of a Nintendo Direct broadcast earlier this year. Longtime fans were so maddened that Nintendo would even dare to retread gameplay elements introduced in Paper Mario: Sticker Star, that it led to them penning a petition demanding the game’s immediate cancellation. It’s a sorry sight to see that games are treated to such swift judgement these days. I remember being largely underwhelmed by Super Mario 3D World‘s E3 2013 reveal trailer, but, having held back my concern, I’ll forever cherish it as one of the greatest games that Nintendo produced for Wii U. And now, having beamingly smiled my way through a hands-off gameplay demonstration for Color Splash, I’m feeling similarly optimistic. That isn’t to say that early impressions indicate that it will swoop in to dethrone The Thousand-Year Door, an insurmountable ‘best in show’ for the Paper Mario series that Intelligent Systems has since found hard to surpass. But, given the short gameplay slice that Nintendo has so far shown, much about the Wii U exclusive remains unknown. Color Splash’s tale revolves around Prism Island, on which Paper Mario and Princess Peach have learned Shy Guys have started draining Toads of all their colour. Accompanied by naive paint bucket Huey, Paper Mario and his new companion must restore normality to the island and discover the true identity of the ‘Master’ behind such plot. As the first high-definition adventure for the mustachioed paper cut-out, it is the game’s visual brilliance that will first astound. Where Yoshi’s Woolly World placed players in a world crafted from fabric and yarn, Color Splash carefully assembles Prism Island with paper and card. Paper Mario is brought to life like never before, and you can easily lose hours simply marvelling at how believably constructed the world around you is. It’s certainly a far cry from the original escapade on Nintendo 64. With colour being drained from Prism Island, it isn’t long before we see unfilled patches on Bloo Bay Beach. It will be down to Paper Mario to restore these with his paint hammer, rewarding you with Coins and Battle Cards. This will consume your paint reserves each time, but it isn’t hard to replenish them. Smacking a blue-coloured flower will supply you with blue paint, flipping over a nearby red shell will reveal red paint while swinging your hammer at a palm tree will see coconuts tumble that crack open to produce yellow paint. This painterly gameplay mechanic is central to Color Splash, and carries over to the battle system. These still start whenever you collide with an enemy, and will see players put Battle Cards to use that are displayed on the Wii U GamePad screen. Gathered on your adventure, these are unpainted and will require that you use your valuable paint reserves to fill them in. This is far from a superficial choice, as cards that are painted will be far stronger in battle instances than those that are left with a duller tone. Once a Battle Card is used it is removed from your collection, and this is an element where fans have expressed concern that it echoes complaints that were directed at 2012’s Sticker Star. Players can spend 10 Coins for a Battle Spin that will reward you with new cards, an effort made in part to reduce instances where the player is left empty-handed mid-battle. That at least addresses one worry. While Color Splash will regularly pose puzzles as you explore, that head-scratching also carries into these battle instances. That’s more clearly seen after climbing The Crimson Tower to confront Morton, who we are told is the first boss that players will face. 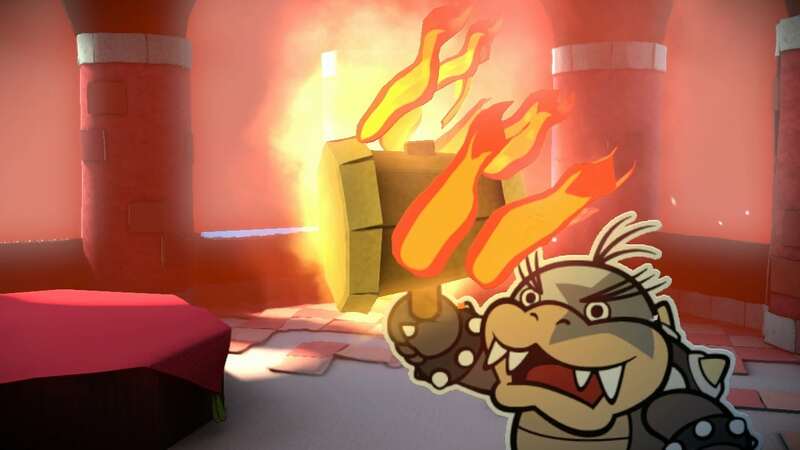 The dim-witted and talkative Koopaling takes to battle on a pedestal, or ‘pedal stool’ as he refers to it, which players will need to whack aside with a hammer-based attack. That leaves Morton open to being stomped on, but your repeated damage-dealing quickly angers him. Attempting to turn the battle in his favour, Morton ignites his hammer with a fierce flame. But, as seen in Sticker Star, players can use Thing Cards which will help when used in correct situations. With these, players can summon a fire extinguisher to douse Morton’s hammer, leaving him with a stick that can only deal 1-damage. The Thing Cards use hilarious and wacky sequences, continuing the unrivalled sense of humour that the series is celebrated for. 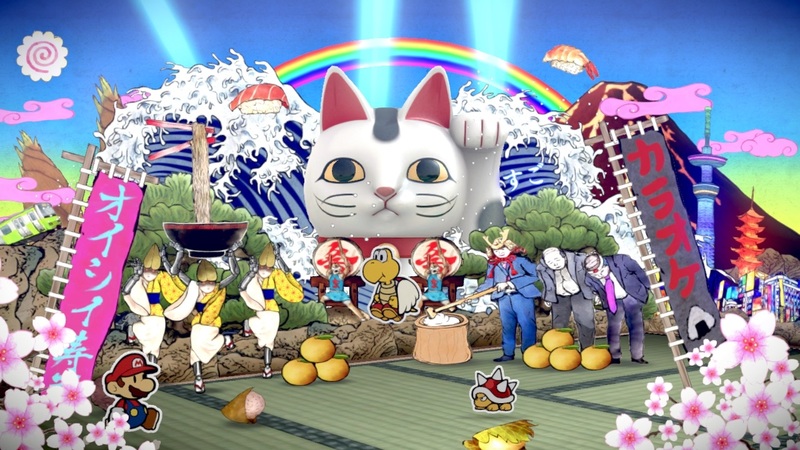 The Cat-O-Luck makes a return, a scene playing out that draws on as many stereotypes related to Japan that Intelligent Systems could think of. It’s quirky genius at its best. With Mario recovering the Big Paint Star from Morton, red paint is restored to the world which colours larger areas that otherwise couldn’t be coated by the paint hammer. This opens up new areas for players to explore, and I am looking forward to all that we are yet to see. Paper Mario: Color Splash arrives in October long before The Legend of Zelda: Breath of the Wild, and appears to be placed as if it will be Nintendo’s penultimate game for Wii U at this point in time. That doesn’t make it any less exciting, a triumphant return for the Paper Mario series that could see Color Splash become one of the flimsy character’s greatest adventures.